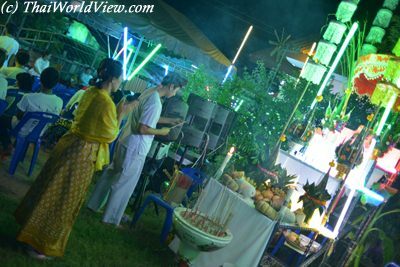 Once a year, a big ritual (งานปีไหว้ครูบาอาจารย์) is celebrated with abundant offerings and gathering of spirit mediums. On the evening of the second day, the most important event happens, i.e. the gathering of around 20 or more spirit mediums. 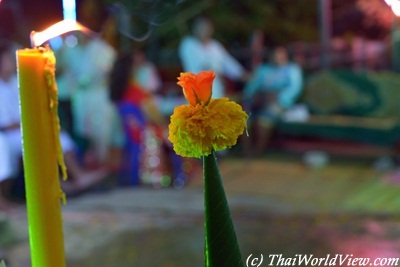 Such parasols (ฉัตร7ชั้น) are made of seven layers of flowers. An orchestra with Indian mystical music is present. The main singer uses mysterious loud paroles. Many spirit mediums are invited as guests. They do sit in the first row. 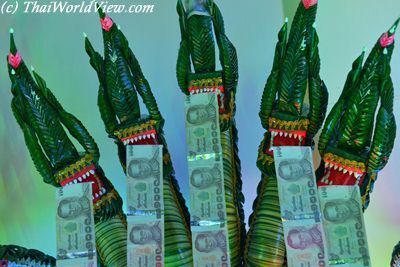 Banknotes donations are inserted in the numerous mouths of the "PHAYANAK" (พยานาค). Most of them are 1000 Baht banknotes! Banknotes are put as garlands and feature value of 20, 100, 500 or 1000 baht. 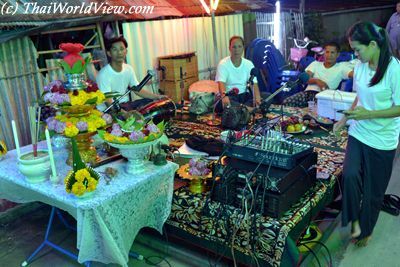 Before starting to play music, a few prayers are performed by the orchestra members. Most of the spirit mediums guest are female and are wearing Indian clothes. Most of them are middle age women. 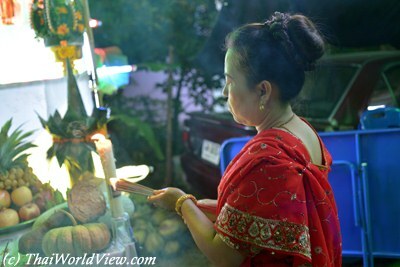 Before sitting, each spirit medium comes to the medium altar to pay their respect (ไหว้เทวดา). 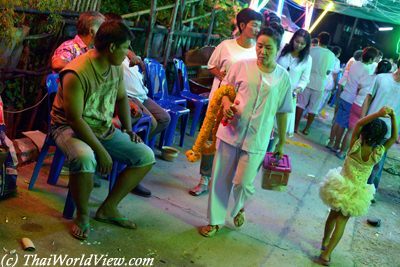 Some possessed spirit mediums then start to perform some dancing in front of the "PHAYANAK" effigy. Most of the male spirit mediums are smoking. 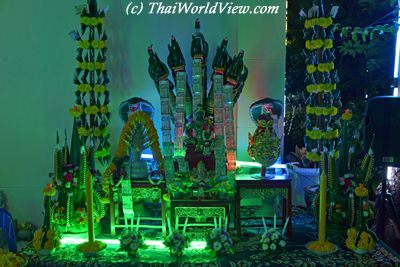 Huge flowers garlands are covering the "PHAYANAK" effigy. 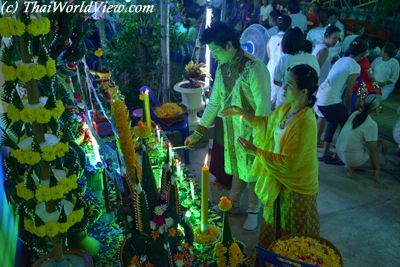 The spirit medium guests pay their respect by adding additional flowers on the effigy. 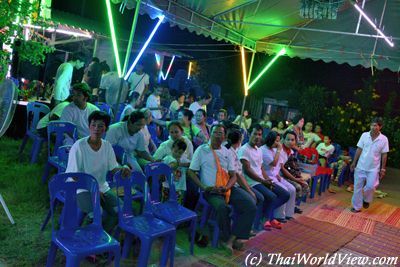 Believers or disciples (ลูกศิษย์) are coming to pay respect to the Spirit Medium host. Most of the spirit mediums female guests are wearing Indian clothes. Men are wearing old traditional clothes, clothes made of fur similar to an ascetic or hermit ("REUSI" - ฤาษี) outfit. Having colorful Indian clothing and showing the tongue during possession identify those spirit mediums attached to Indian deities. Spirit mediums are greeting each other. It seems to be a limited community so same spirit mediums often meet each other at different rituals. A huge crowd is present today to assist to the mystical spirit mediums dances. This spirit Medium is wearing colorful Indian deities. 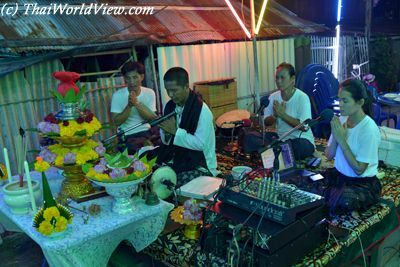 The dynamic music is supposed to encourage mediums to enter into trance and to be possessed by spirits. Some spirit mediums start to behave like children and are even asking for lollipops. 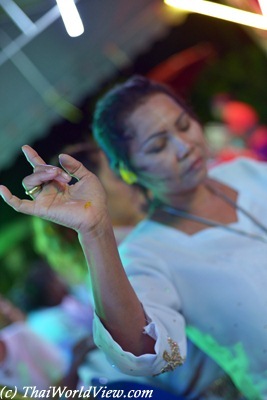 Spirit mediums are entering trance and then get possessed by a spirit (เชิญองค์). Some spirit mediums are possessed by old spirits so behave like elderly people having difficulty to walk and using a walking stick. 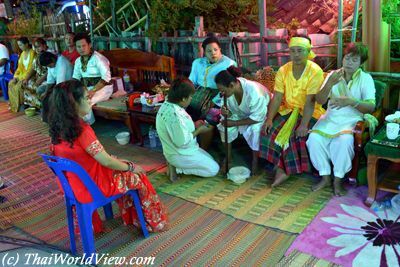 Some spirit mediums being possessed by old spirits perform old habits such as chewing betel. One of the mystical dances performed by the spirit mediums is a dance with fire balls in the hand. Basically when possessed, spirit mediums forget society taboos and may behave inappropriately. 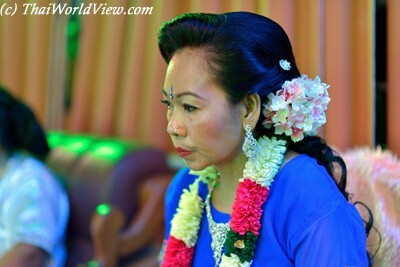 Some spirit mediums are wearing old Ayuthaya style clothes as they are possessed by former Kings. 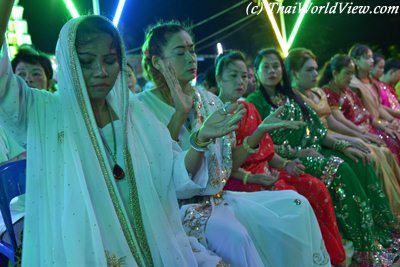 Spirit mediums possessed by spirits then perform some dancing in front of the "PHAYANAK" altar. 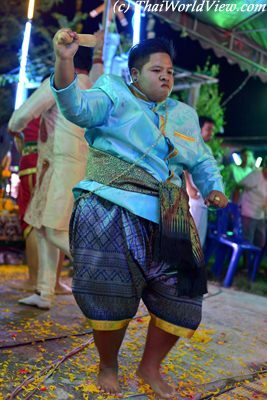 This spirits dance is for the main spirit (ปู่) who is the event organiser. This ritual lasts more than two hours until the spirit mediums leave one by one. Some young women might wear a Kinaree (กินรี) clothing, i.e. an angel-like costume. Some local spirit mediums can "feel" that many spirits (องค์) were around that day. Some local people hope to get lottery numbers from the spirit host. Some key spirit mediums have an helper to answer to their basic needs during the event. 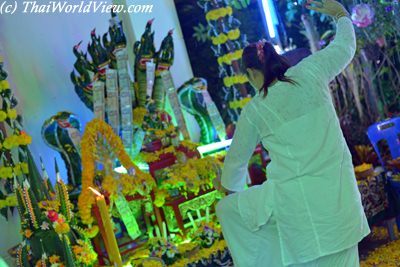 The rain coming on this evening was seen as a holy event showing the spirits appreciation. Some young ladies even faint. The event ends up with the host spirit medium wishing everybody to be rich and asking do a feast for next year! 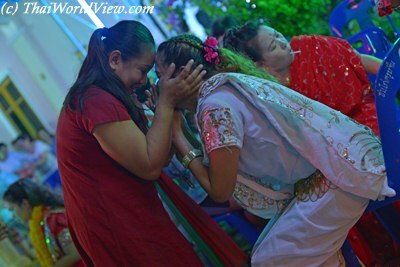 Spirit mediums (ญาติเทพ) are greeting each other. 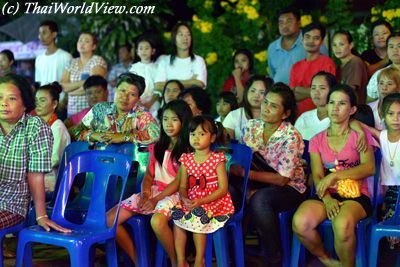 If a rich sponsor is involved, then the event may also features Likay or outdoor cinema. Above ritual is a yearly event. 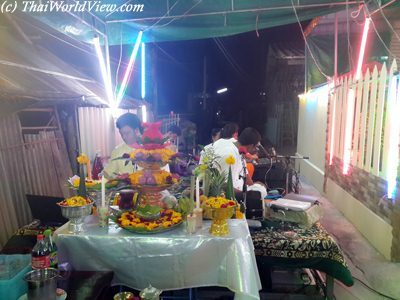 Some more frequent events called (งานแก้บน) are also organized. Normally people ask favors from the spirits. A woman having her period cannot go inside the building containing the sacred altar. 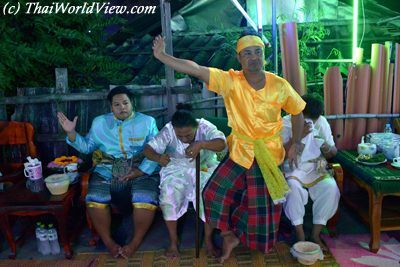 During the smaller scale events, only a few dances by the medium spirits are happening. 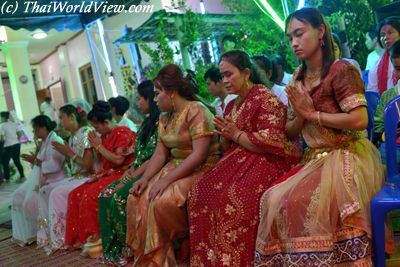 Thai Buddhism is impregnated by ghosts stories coming from Buddhist legends. 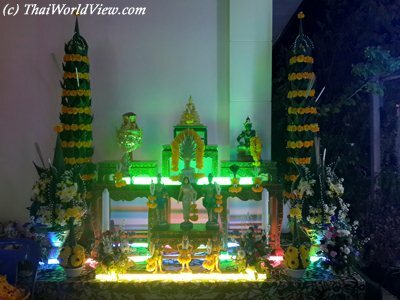 But it is also impregnated by ghosts stories and beliefs coming from ancient religions (Hinduism, Brahmanism) present before Buddhism in Thailand.